I invest a great deal of time today in executive coaching and consulting – to include conducting training workshops on two of the most common challenges for many companies – (1) identifying and building transformative leaders and (2) crafting what I call enduring high performance teams. In a recent interview I was asked about the genesis of one of those programs. Like everyone else – the sum of my experiences and the outside resources I’ve availed myself of over the years have meant everything. In that vein, allow me to tell you then, a most remarkable story. He died almost 100 years ago. In his lifetime he led or participated in three of the most dangerous expeditions in human history. Each of them ended in failure. Undaunted, he was readying for a fourth attempt when he died suddenly of a heart attack – only days shy of his 48th birthday. Ernest Shackleton is largely forgotten by all but historians today. Few pause to reflect on the period known as The Heroic Age of Antarctic Exploration – or the brave men that were the principals in one of the most astonishing epochs in human history. At the turn of the 20th century the eyes of the world were focused on the unexplored – in Peru, Hiram Bingham was stumbling on the remains of the lost Incan city of Machu Picchu and not far away Percy Fawcett had begun a series of excursions into the wilds of the Amazon that would eventually lead to his ill-fated search for the Lost City of Z. Robert Peary was trekking across the ice floes of the Artic – and at the bottom of the world intrepid adventurers were trying to make their way to the South Pole. At the vanguard of the latter was British explorer Ernest Shackleton, an Irish born Merchant Navy officer determined to make history. He chose the most desolate and dangerous place on earth to stake that claim. The continent of Antarctica is unlike any other place on this planet. The mean annual temperature ranges from a balmy Minus14.8 degrees Fahrenheit on one coast to Minus 26.8 degrees on the other. The interior mean is Minus 70.6 degrees. The coldest recorded temperature in history was captured there – Minus 128.6 – only to be topped by satellite recordings that reached Minus 135.8 degrees. The Katabati winds – frigid air that flows down from the polar interior across the steep vertical drops along the coasts – are so powerful that other weather fronts never reach the continent. They have been recorded at 199 miles – the highest on earth – bringing wind chill factors to scarcely imaginable levels. Ninety percent of the world’s ice lies in Antarctica – covering the continent in a mile thick layer that, if it ever melted, would create floods of biblical proportion across the world. Onto that stage Shackleton ventured as the Third Officer of Captain Robert Falcon Scott’s Discovery Expedition in 1901 – an attempt to reach the pole. In a march that exceeded any to that point in history, Shackleton, Scott and another comrade from the ship The Discovery marched into the frigid cold. All 22 dogs that accompanied them died. The three men suffered from snow blindness and frostbite. Shackleton himself broke down physically – unable to fulfill his share of the work. When they reached finally the safety of the ship Commander Scott sent Shackleton home. In the years that followed Scott would point to the reasons for failure as beginning with the “invalid” Shackleton. It was a wound to his pride that Shackleton would carry with him for the rest of his life. Five years later he would lead a second march on the pole – as commander of the ship Nimrod. The four overland expedition party members came within 100 miles of their goal – the greatest single advance in exploration history. Shackleton did not reach his dream– but he earned knighthood and was celebrated around the globe on his return. And so he tried again – and one of the most remarkable stories of human survival in history unfolded on a harsh, windswept desert of ice that – even today, stands as one of man’s greatest accomplishments – yet wrapped in abject failure. The mission to reach the South Pole was quashed before it began. In the years that followed the Nimrod’s attempt two seismic events intervened. First, in 1911 Norwegian explorer Roald Amundsen had finally achieved the impossible. He reached the summit – becoming the first man to stand on the southern most tip of the world. The race was over. Second, peer and former shipmate Robert Scott had arrived at the same point only weeks after Amundsen, and then he and the other members of the overland expedition had perished in the return – some 11 miles short of safety. For Shackleton, only one recourse remained – to attempt what German explorer Wilhelm Filchner had already failed to do – a journey across the whole of Antarctica that would cross the pole on the way – an 1800 mile trek that many considered impossible. The Imperial Trans-Atlantic Expedition began in 1914 – and from almost the very beginning was destined for disaster. The reasons were many. The Norwegian Expedition that successfully reached the pole several years before had relied heavily on dog teams to haul supplies – as well as skis for the cross-country hike. The British had little to no experience with either. They were not prepared for the scope of the challenge that lay ahead – and hadn’t fully factored the strategic advantages that led to Amundsen’s success. The Endurance sailed late in the year – departing South Georgia Island on December 5th despite whalers’ warnings – and encountered ice floes that eventually trapped it on January 19th of 1915 – still miles from the Antarctic coast. Ten months later Shackleton ordered the men to abandon ship – and the 27 crewmen hastily worked to salvage supplies – making camp on the ice – praying for their vessel’s release while trying to survive in inhospitable conditions. In November, wracked by millions of pounds of pressure The Endurance slipped under water – never to be seen again. The men were hundreds of miles from any known outpost – lost and alone with virtually no hope for rescue. Locked in the death grip of the dreaded ice, no member of the Imperial Trans-Antarctic Expedition would ever even reach the continent of Antarctica. Shackleton knew his dreams of glory were dashed – and probably forever. Back home a world war was unfolding – and funding for another adventure like this would never be contemplated. The loss of the ship meant failure – for the third time – for Ernest Shackleton. Which makes the rest of this story so very amazing – because at a point where one what might assume the vain glorious adventurer who had sacrificed so much to be the “first” would have fallen into self-pity and depression – instead Ernest Shackleton became something more – shipwrecked on a block of floating ice and facing a level of adversity that even today seems unimaginable. Their frozen hell had no intention of releasing them. An attempt to march across the floes and closer to Paulet Island failed miserably in the first days. The weather was scarcely survivable. For the next several months the members of the expedition huddled in tents – living off the stores salvaged from the ship and praying for salvation. Shackleton was the picture of calm from the first moments that the ship had become trapped. He believed in the importance of maintaining duty responsibilities – and that also included now mixing officers, scientists, and sailors freely. Idleness of any type couldn’t be tolerated. His demeanor, some crewmembers would say later, was so supremely confident that others began to mirror it. Each evening the crew would gather in the wardroom of the ill-fated ship for parlor games, talk of politics, the war, or even sing-alongs. There was an enthusiasm for the expedition that was palpable – due in large part by what one member was to describe as “the greatest optimist living”….the Boss. For the ten months that separated their imprisonment in the ice floes to the final sinking of the ship the crew of The Endurance continued to believe in the overland expedition – until the dream was crushed. But in those moments of total defeat The Boss would rise again. In the days before they lost their ship the men had worked feverishly to shift 3 tons of food and supplies (to include 3 lifeboats) to the ice camps nearby. In the hours before The Endurance sank Shackleton insisted the ship’s banjo be transferred as well. The Boss knew the dream of walking the continent was no more. More important, he knew that if the men’s spirits sank too then all was truly lost. He divided the men into five tents – and separated them according to both their physical skills and emotional prowess – careful to place possible malcontents in his own lodgings. Shackleton, it seems – decided that the real fight was only beginning – to reclaim the hearts and minds of the brave men around him. It was a battle that had been joined as early as January and even before The Endurance failed. Once he came out waltzing on the ice with the first mate. On another occasion he hosted the Antarctic Derby – dog races the men gambled on. When anxiety began to build he directed the ship’s barber to have a “shearing night” where the men could watch selected crew members have their locks shorn – and it was Shackleton who volunteered to be the first “victim” – much to the delight of the others. They had “movie nights” where the ship’s photographer would share still photographs – on other occasions they would play singing games. Anything to keep the men focused on the certainty of success. This continued now that they were alone on the ice without hope of rescue. Shackleton directed the cook to manage the food stores with incredible creativity – sometimes surprising tired and hungry crewmembers with warm milk and jam – and quietly giving up his own personal ration when he saw another man beginning to lag or give up hope. The days of total darkness in early May now gave way to 16 hours plus of daylight – and the men were exhausted. Shackleton himself fought with painful bouts of sciatica but few knew it. When he walked in front of his men the Boss was the picture of health – and optimism. Crewmembers would say later that they never saw fear in his eyes – ever. Survival was one thing – rescue an entirely different matter. The ice floes had carried the crew of The Endurance hundreds of miles from their original destination – and in the wrong direction. Supplies began to grow scarce. The seals and penguins had mysteriously vanished – and so the designated hunters began to return to camp empty handed. In mid-January Shackleton ordered the beloved dogs shot – and they became part of the dwindling food source of the starving men. Each night The Boss visited each tent to bolster spirits – or just to engage in small talk – anything to keep crewmembers from surrendering to the oppressive feelings of hopelessness that threatened to overwhelm. In April of 1916 the ice on which they were camped began to break apart. Shackleton gave the orders for the men to board the 3 lifeboats. The crew of The Endurance was returning to the sea. The first day – dodging giant chunks of the formidable ice and trying to find a way between massive swells and through the frigid winds – almost ended in immediate disaster. That evening a seaman was cast overboard still in his sleeping bag – only to be hauled back in a near Herculean effort by Shackleton before two huge shards of ice closed around him. On the second day sextant reading indicated they were making little to no progress – and the men were foundering. The team had forgotten to bring fresh water ice. Many were sick from eating the remaining morsels of food that were tainted. In a bold move Shackleton moved to the helm of the lead lifeboat – where he stood there all that day and night – a symbolic figure of triumph that so stirred the men that none could capitulate. When the ship’s photographer lost his mittens fighting the currents it was Shackleton who gave him his as replacement – ordering his reluctant underling to accept them. The Boss suffered frostbite. The crew only marveled. Three days later – haggard and near death – they landed on the remote shores of Elephant Island – an inhospitable patch of rock some 350 miles from where The Endurance had sank. The 28 men rejoiced – if only for a short time – at feeling land underneath their feet. But they were no closer to salvation. The island offered no protection from the waves and wind – at best they could hope to survive a few months on Elephant Island. Shackleton considered his options carefully before finally announcing a small party must continue on – to hopefully reach a foreign outpost where help could be summoned. It was their only hope. He assembled five men to join him in the 22 foot lifeboat named James Caird – and on April 24th they set sail for South Georgia Island some 800 miles away – across seas that were virtually impassable for even the largest of ships. Over the next two weeks the tiny vessel endured gale force winds – and waves so large that the top of the mast disappeared between the peaks. The men divided into two teams of 3 each, taking turns sleeping – and trying to reach a dot on the map that if they missed it, would leave them with 3,000 miles of open sea. Frostbite and infection was soon overcome with the pain of hunger – 2 of the men grew closer to death. Accounts indicate that Shackleton again gave up his rations to bolster the flagging crewmates. On the tenth day The Boss believed he finally saw a sliver of clear sky in the distance – only to find to his horror that a wave so massive that it blocked out everything else was descending on them. By what can only be considered an act of God they survived it. But now their water supplies had come to an end. Their throats were so swollen they could no longer swallow their remaining morsels of food. Death almost seemed merciful. And then the hurricane struck – one so powerful that it sank a 500-ton freighter in the same storm. But the tiny lifeboat – like a top bouncing on a tsunami – somehow made it through. On May 10th, 1916, after five unsuccessful attempts, the James Caird finally made land. One hundred years later its voyage is still considered one of the most amazing feats in nautical history. They had arrived on the west coast of South Georgia Island – the mountainous and uninhabited part – instead of their hoped for eastern shore target. The battered boat was no longer seaworthy – and the risk of trying to sail it to the whaling station on the other side couldn’t be taken. Once again, The Boss had a pivotal decision to make. Shackleton decided he and two of the men would attempt a hazardous trek overland – something that had never been done before. After resting a few days the next chapter of their amazing odyssey began. On May 19th – loaded with the barest of supplies and makeshift crampons for their boots the three trudged into the unknown. For the next 32 hours they walked without stopping – until fog surrounded them as nightfall descended. Now they faced the risk of hypothermia if they couldn’t find a way to drop to lower altitudes but there path was virtually invisible. Shackleton – at the end of this incredible journey – took one final death defying risk. He announced that the party would slide down the slope of the mountain – hoping cliffs were not just beyond. Using the coiled rope they carried as a sled the men sat down and allowed gravity to carry them – descending an astonishing 1500 feet in a matter of minutes. Just before dawn they paused to rest and while the other two slept Shackleton stood watch. On May 20th they reached the whaling station. The Boss knew the men he left behind on Elephant Island were dying. He rushed to assemble a rescue party but his country was at war – no naval ship could be dispatched for a trip to a remote spit of land to recover adventurers who might very well no longer be alive. He appealed to several South American governments – and a Uruguayan vessel was launched on June 16th to recover them. The attempt failed. A July attempt also fell short – as did a third. His crewmate Frank Worsley was to say in the years after that it was only then that he could see the tremendous stress Shackleton labored under – separated from his dear men but still committed to saving them. By the time of the fourth attempt The Boss had grown gray with worry. On August 30th, 2016 – some four months after leaving them behind – the Chilean vessel The Yelcho with Shackleton at the helm finally reached Elephant Island. As the ship approached The Boss drew his binoculars and studied carefully the outline of the figures on shore – he counted 22 men. He had done the impossible. Every man was destined to return home alive. Postscript – On Jan. 5th, 1922 – as he lay in his cabin onboard the ship Quest – readying for a fourth attempt for a transcontinental trek across Antarctica – Ernest Shackleton died of a heart attack. At his widow’s request he was buried on South Georgia Island. Eight of the crew that had joined him for the earlier expedition had already volunteered to join The Boss for this final effort. It was not to be. Ernest Shackleton and the crew of The Endurance failed to realize their goal of crossing the continent of Antarctica – but the larger success they realized in surviving the expedition is without question one of the most significant in human history. 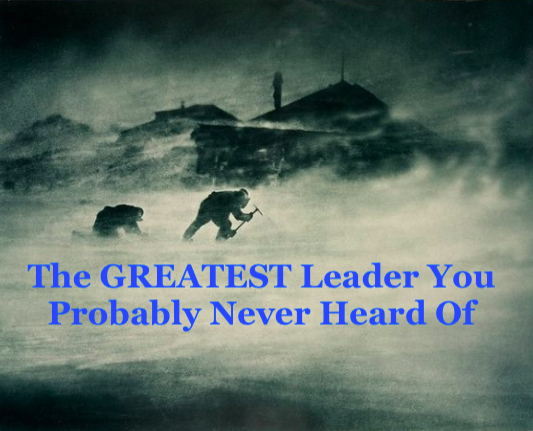 The reasons they survived can first be traced to the enormous courage of their leader – but it speaks also to basic principles that distinguish leaders and how they respond in times of crisis – and the foundations that can be crafted that separate what I will always refer to as “enduring” high performance teams – a concession to The Endurance and their legacy for the ages. Today we all face moments of adversity – and in the business world they can sometimes seem cataclysmic. They seldom are – certainly not when placed in the context of Shackleton and the Imperial Trans-Atlantic Expedition. The lessons of The Boss are timeless. But it was only when I began to study the distinctive characteristics of the few transformative leaders and the teams they assembled over the course of my 38 year journey in the corporate world that I truly appreciated the scope of that message. There is no magic formula to transformative leadership – or to crafting teams that excel. But there are markers that we can use to set a course – a compass that can offer guidance – if we are committed to finding them. Remember The Endurance. Remember what can be.